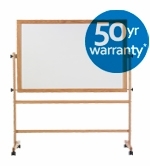 Wood Framed free standing, reversible and portable dry erase boards and bulletin boards from OptiMA Inc. These beautifully oak framed freestanding units that are reversible and portable they may also fit into any office, conference room, training room or classroom decor. 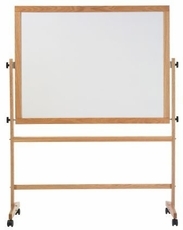 Wide full-length tray for storage of dry erase markers, erasers, etc. 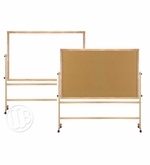 These free standing boards come with locking casters and the exclusive double pin-locking system to secure board and add stability at time of usage. 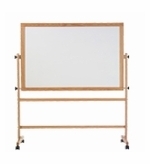 Four different panel options to choose from including magnetic dry erase boards, a more economical Melamine writing surface and a natural tan cork tackboard surface. Other surfaces and custom configurations available through customer service. Porcelain steel, magnetic dry erase writing surface. 50 Year Warranty. Economical Melamine, Non-magnetic dry erase writing surface on both Sides. 50 Yr. Magnetic dry erase writing surface and Cork.